John Player Special non-standard playing cards created by the illustrator Nick Price, 1987. All cards are printed in red, gold, black & white with black borders. The aces show birds and leaves, the kings are mounted on horseback, the queens hold either a cat or a dog and the jacks are craftsmen, musicians or scientists. The pack is also known with gold borders and a matching back design. 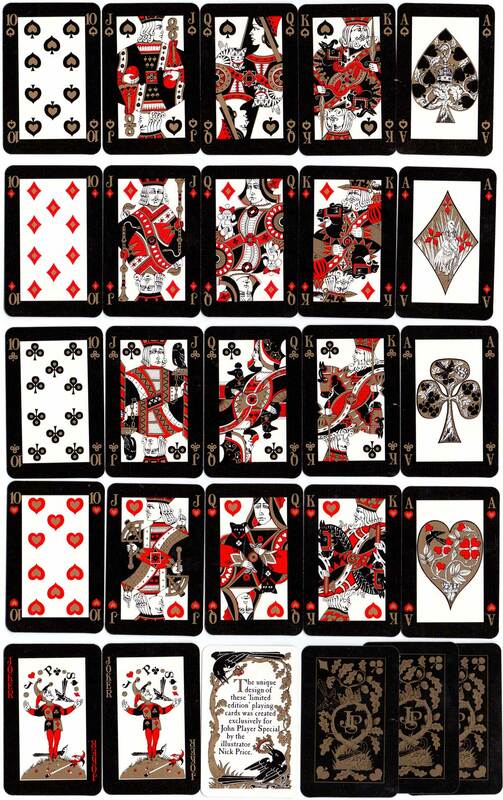 Above: John Player Special non-standard playing cards featuring the charming designs of illustrator Nick Price, 1987. Printed in a limited edition by Carta Mundi.